Available for Christmas 2013, “3 Wise Queens” brings a joyous new perspective to the beloved Epiphany story. I have loved the story of the Wise Men since I was a child, and thought a story of Wise Queens would be one that girls might especially enjoy. Author James Allen today announced the launch of 3 Wise Queens, a new children's book app for iPad® as well as Android tablets. 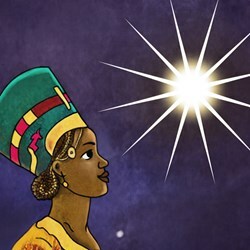 Brand new for Christmas 2013, this app tells the story of Hekima, Sophia and Mingzhi who—guided by prophecy and a star—embark on a journey across three continents to find a baby who will change the world forever. Children will enjoy the numerous interactive elements, including floating cherry blossoms, sailing ships and roaring lions. Narration is activated by touching the angel icon at the bottom of each page. 3 Wise Queens expands on the beloved Christmas story in which Wise Men bring gifts of gold, frankincense and myrrh to Jesus at his birth. In this reverent and yet playful retelling of the story, we come to understand that the choice of those gifts is based largely on the advice of their wives—the Wise Queens. When the men select offerings fit for an earthly king, the Wise Queens guide them toward gifts that are more suitable for the Heavenly King they are expecting. 3 Wise Queens is more than a joyous retelling of the epiphany story. With interactivity on every page, the app is packed with touch and tilt-activated movement and sound. Children will enjoy finding hidden birds and panda bears in Mingzhi’s garden, playing with Sophia’s gift of frankincense, and watching with Hekima as a singing choir of angels rises into the night sky. Lush illustrations and original musical arrangements celebrate the cultures of Africa, Europe and Asia. Author James Allen is a lifelong member of the United Methodist Church, has worked in educational children's media for 15 years and holds a Master’s Degree in Communication. Allen’s love of art history guided the artwork for this app, brought alive by illustrator András Barlogh. Parents will be thrilled by the quality of the music by Michael Dauterman, a professional choir director with a Master’s Degree in Sacred Music. Mary Toney rounds out this skillful team with her warm narration. Allen was inspired to develop this app for his daughter. “I have loved the story of the Wise Men since I was a child, and thought a story of Wise Queens would be one that girls might especially enjoy,” said Allen. The 3 Wise Queens App is available for $2.99 from the App Store℠ on iPad (link) and for Android tablets in the Amazon Appstore (link). More information is available at 3wisequeens.com. Queen Hekima and King Balthazar rejoice upon seeing the Star of Bethlehem. The garden of Queen Mingzhi and King Melchior. Queen Mingzhi surprises King Caspar. The queens and kings arrive in Bethlehem. Queen Sophia worships baby Jesus.